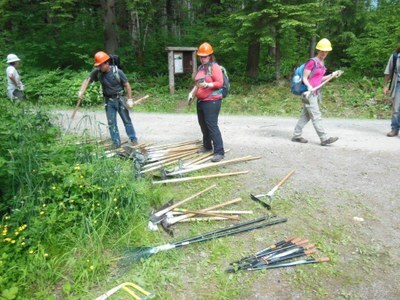 Our Everett Branch organized 50+ people for trail work on the White Chuck Bench Trail near Darrington as part of National Trails Day. 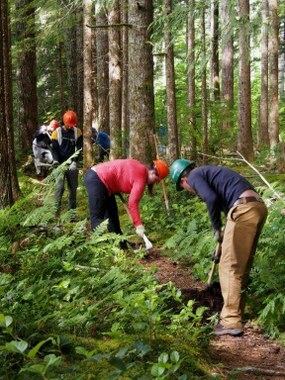 Bringing responsible outdoor recreation to this beautiful area provides economic support to the Darrington Community in the aftermath of the tragic Oso mudslide. The Mountaineers supported the 20th Anniversary of National Trails Day on June 7 through work on the White Chuck Bench Trail. Outside of Darrington, this trail is used by the community to promote tourism to the area, which was hard-hit by the tragic Oso mudslide. The Everett Lookout and Trail Maintenance folks brought together a wide range of community members for this successful day of trail work, including personnel from the Forest Service, Darrington Mayor Dan Rankin, Congressional Representative Suzan DelBene and her husband, and Mountaineers members that included President Dan Lauren and Everett Branch Chair Matt Vadnal. On this one day, approximately 1 km of trail work was completed, which included redoing the tread, widening the trail, removing trip hazards like roots, and installing water bars and water diversions. The volunteers broke into five groups to start work on the trail to generate new life into the old path, and ended the day with a sense of accomplishment, pride, and ownership of the trail that they completed. 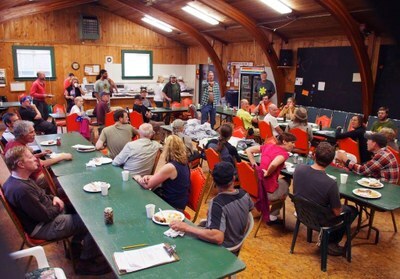 The volunteers were greeted back at the Grange Hall in downtown Darrington where they had a large dinner set up -along with homemade cobbler that was a huge hit for all involved. Thanks to everyone who participated and made this event so successful. For anyone unable to attend, please visit the Darrington’s outdoor area for your next outdoor outing and visit the White Chuck Bench trail nine miles up the old Mt. 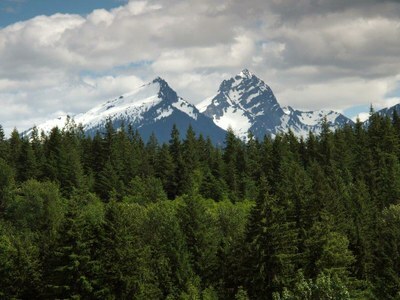 Loop Highway and walk the path to beautiful views of the magnificent peaks in the Darrington area. Remember that you can download the new Destination Darrington map that The Mountaineers helped put together that highlights all types of outdoor recreation opportunities in the area, or pick up a printed copy at Outdoor Research or REI stores. 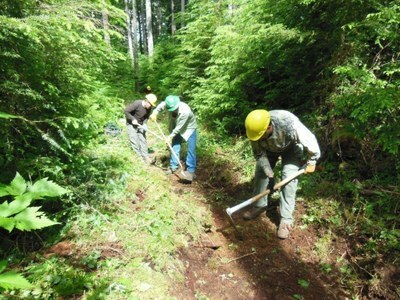 The Everett Branch's Lookout & Trail Maintenance Committee is willing to help other branches develop programs to support more trail maintenance projects and are happy to help instruct other leaders so that they can teach the necessary skills. Feel free to go and join the Everett Mountaineers Lookout and Trail Maintenance Facebook page to check out more pictures and THANK YOU to all the volunteers that helped out that day, here and across Washington!